A few nights back I decided to get the project finished. 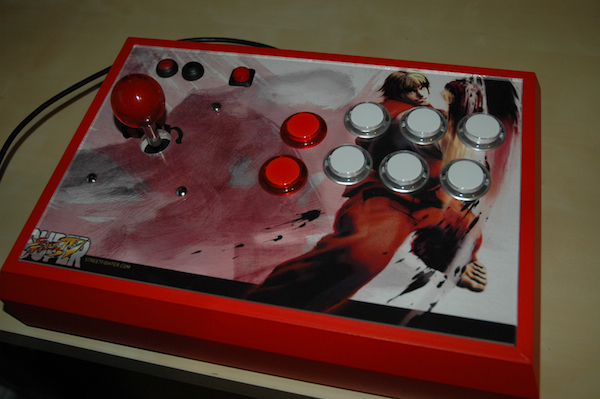 First up was making sure the fight stick itself could be recognised by a PC and PS3. This failed to work. The closest I could get was a windows error saying the USB device failed to load. After some testing and investigation, it looked like the USB connector on the Dual Strike PCB was to blame. 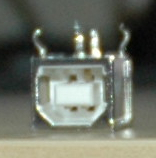 A closer look at the USB (Type B) port showed one of the internal pins had been squashed back, ensuring a bad connection. Looks like at some point the port had something lean against it, and cause the pin to come lose. I got out the soldering iron and took it off the board. It probably isn’t clear in the image below, but the top right pin (inside the port) has been lifted up and is completely loose. A replacement part was found at Jaycar for only $3. I added it to the board, connected up the PCB to the PC and success. 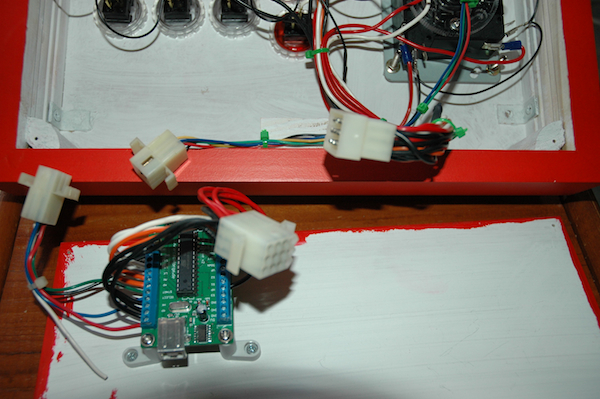 After that, I rechecked all the wiring and ensured the button mapping was correct. 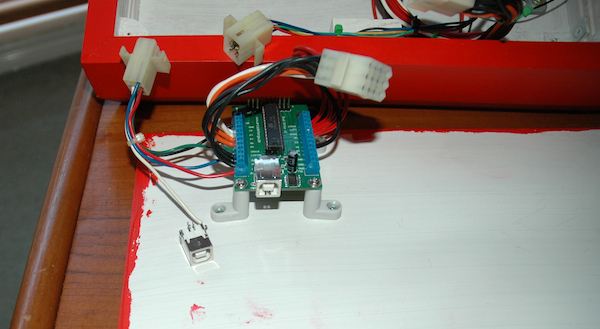 When I did the wiring, I decided to use molex connectors between the PCB and the buttons. This is really handy for taking off the base of the fight stick as I don’t have to unscrew any wires and can split the fight stick into 2 parts for any work required. I purchased a 3m long USB cable from ebay ($2 delivered), screwed the base into place and added 6 rubber feet to ensure no slip when it is being used on a flat surface. After giving it a test run, I’m now happy to say the project is completed. I’ve got some left over parts to build another one – which I possibly will at some point and factor in some improvements. It was an enjoyable project.